For the fourth of July, I thought I would do a special report on four names which have experienced a large upside move (near 2 month high) on extremely high volume (compared to 3 month average for stock volume). Moving up is always a good sign for any stocks, on BIG volume is an even better sign. The stocks are ranked in order from the greatest % volume change (above volume) to least. It also happens to be their % change on Thursday. To finish this short trading week the indices finished the day lower. This sell off was sparked after a dismal jobs report. The Dow Jones Industrial Average finished lower by 223.32 points, S&P 500 lower by 26.91 points, and the NASDAQ lower by 49.20 points. Looking at the charts we can see a bearish pattern has formed, the head and shoulders pattern. The chart below of the S&P SPDR (SPY) is marked up to illustrate this pattern. A bullish sign would be an uptrend pattern which is higher highs and higher lows. However as you can see after the market peaked in early June (black line labeled top of head) and a bounce off resistance in later June (black line labeled bottom of right shoulder), we did not set new highs before selling off or forming the second (right) shoulder. A critical point to hold above is 89 on the SPY. If we can hold above 89, and eventually break above the 93 range on the SPY, I think we have a shot at testing the highs of 96 and eventually moving higher. However, if we break below 89 on the SPY, I believe the S&P will be in a downtrend until 85 on the SPY (850 range on the S&P 500). The only silver lining from Thursday's sell off was that the volume was on the lighter side. Life Takes Visa. When Will the S&P 500? In recent blog posts I've talked about the DOW effect, Russell effect, so I decided I would devote this post to the S&P effect. The S&P 500, much like the DOW has a committee which selects the stocks in the index. I believe it's only a matter of time before Visa (V) is added to the S&P 500. I believe this because Visa is the last credit card giant not listed in the index, not to mention Visa is larger and more profitable than all four of the similar companies currently listed in the index. These companies are: American Express (AXP), Capital One (COF), Discover Financial (DFS), and (Mastercard (MA). Visa's current market cap is actually bigger than any two of the four added together. The table below is each of the companies listed above ranked by market cap. When a company is added to a benchmark index like the S&P 500 the stock usually gains strength and popularity. The reason behind this is there are a lot of funds which start accumulating shares of the stock added as they want to track the performance of the S&P 500. I started paying attention to the S&P effect back when it was announced on mid day March 23, 2006 that Google (GOOG) was going to be added to the S&P 500 on March 31, 2006. I noticed Google popped over 9% after the news broke, and rose by over 7.5% the next day on the news, and continued to rally until the most recent market downturn. Year to date there have been 11 additions (equally 11 deletions) to the S&P 500 index. To track the recent performance of how stocks react to being added to the S&P 500, I have selected the 11 stocks added this year, and calculated their % change the day it was announced that they were going to be added to the S&P 500 index (usually announced after hours, 1 week prior to the add date), and their performance since the announcement (by now all 11 have joined the index). The S&P 500 announces these changes before the company is added to the index unlike the Russell 3000, therefore the stocks will usually experience a great amount of buying on the news versus when it is actually added. I could not find the exact dates the news was released for all 11 of these companies, so for those stocks I could not find the date the news was released, I use a time of 1 week before the stock was added to the index. To get a better idea of how Visa may react, we can look at Mastercard which was added to the S&P 500 on July 17, 2008, however it was announced after hours July 10, 2008. The stock quickly rose almost 5% after hours, but finished the next day of trading higher by 1.64% following the announcement. The shares rose higher by almost 14% by the day they were added, which happens to be the current 52 week high (290.96 on July 17, 2008). Mastercard is down 33.41% since it was added, but given the market we've had since July 2008 that is certainly understandable. So if life takes Visa, then why not the S&P 500? I think it's only a matter of time before the king of credit cards gets added to the index. I have been accumulating Visa for a long time. Getting a spot in the S&P 500 is not my reason for investing in Visa, but it will be a bonus when they do get added to the S&P 500. I'll put my money on Visa because one it's a great American company (and icon), and two I think if (and it's also only a matter of time) retail rebounds (consumer confidence increases and people spend money) in the U.S., Visa is sure to benefit from it. I would buy Visa below 60 a share, which would put a dividend yield of 0.7% which isn't too bad considering they are expected to grow earnings by 25% over 2009, and 19% in 2010. 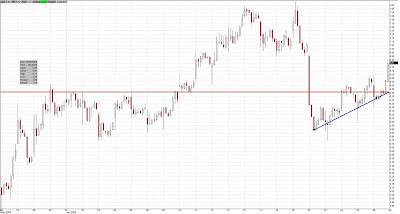 Another way I've been investing in Visa is buying the Leap 2011 call options. When Visa was in the low 40's early this year, I purchased several in the money call options for the January 2011 40 strike for less than $800 per contract. Today these same contracts can be sold at a bid of $2250 per contract. I do not plan on selling anytime soon as I have over 550 days until expiration, but I may look at selling half of the contracts out for the same expiration at a higher strike (also known as a call spread). Today I could buy the January 2011 60 strike call options for roughly $1300 per contract. Visa is at 62.26 per share, which puts this option in the money by $2.26, in order to break even from this position (assuming one waited until expiration) Visa would need gain 18.3% by January 2011 (this assumes Visa keeps their dividend steady, which would pay out 63 cents over this period). So breaking this down one could open a long position with 100 shares of Visa today for $6,226, or the rights to 500 shares of the stock at $60 until January 2011 for roughly $6500. I think Visa is capable of getting to $100 by January 2011, but being conservative I'll take the current 52 week high, which is $82 a share. 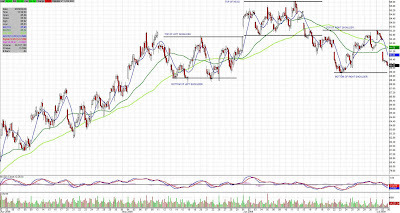 Let's say Visa is at $82 a share come January 2011 and I decide to get out of my position. If I opened a position with 100 shares of Visa I would have made a profit of $2,037 or 32.7% (includes dividends). If I opened 5 option contracts for the Visa January 2011 $60 strike I could exercise the options and purchase the stock on that day for $60 a share. This strategy would give me a profit of $4,500 or 69.2%. To learn more about options and opening a position like this check out my option E-Books. This is a bullish strategy and note that if Visa is at $64.99 per share or less at expiration 100% of the investment will be lost, while a slight gain would have been made by purchasing the common shares. In this week's report I am covering 20 different stocks, as I have found many stocks with very bullish techincals on them. This week there does not seem to be a specific trend among the stocks like last week's, which were mostly from the healthcare sector. To get a detailed list of what I screen for in the Bull to Bear ratio check out my blog post here. The stocks in the list below are ranked alphabetically. All of the stocks listed above have excellent technicals on them; however I like 3PAR, and Rackspace Hosting. The reasons and how I am trading them are detailed below. 3PAR (PAR): is a utility storage company, which has a ton of potential growth in the future. The company has been listed for less than a year, and they currently make money. The estimated earnings growth rate for 2010 is 78%, and 125% in 2011. This stock has already been on a tear but by looking at the chart, I think it can keep going. If you can chart stocks, take a look at the ascending triangle formed on this stock where it ran into resistance at the 11 range. As of Wednesday the stock closed above resistance at 11, and kept on moving up. Friday the stock ripped above its 10 day moving average. It will be interesting to see if this stock can keep up the move. I will be accumulating some call options on this stock on any weakness. I am most interested in the July or August 12.50 call options. To learn more about options click here. Rackspace Hosting (RAX): is a company in the business of hosting and cloud computing. They also make money and have huge potential growth. The expected earnings growth rate for 2009 is 130%, and 43% for 2010. On Friday the stock exploded 7% to the upside with conviction. The 10 day average volume for this stock is just over half a million shares, the volume Friday was 6.89 million shares. There is an investor conference call Tuesday June 30, which would be great to get in on if you're interested in this company; I know I'll be listening in. I will be looking to get into some call options as well on this company. As of now they do not have any options out above the 15 strike range. I think I will be looking to scoop up some call options on this for the September 15 strike, and hope for a pop so I can complete a call spread on this stock to return some of my risk immediately (for more info on call spreads and other advanced option strategies click here). Opening call positions is very risky as you can lose 100% of your investment if the desired strike is not met, however the return can be much greater than holding common shares. I purchase calls when stocks have experienced a large gain in a short time period, as these quick risers can crash just as fast. However if I were purchasing common shares of these companies I would wait for a 7%-10% pull back, and would use tight stop losses. Recently I have been posting about a stock Gulfport Energy (GPOR) and how I am bullish on it. Recently we've experienced a slight pull back on the stock and I've been accumulating shares of the stock. Recently I have also started using a new strategy as this stock can move down very fast and although I can lose 100% of my investment it is less than 2% of the risk of buying the common shares and watching the stock go to zero. First Reason for purchasing the stock: The stock ranks high on both of my methods of finding and evaluating stocks. The current bull to bear ratio is 12:0, and the current IBD is an A- which is still a buy signal from them. To get more info on these stock rating methods check out the posts under my "hottest blog posts" section. Second Reason for purchasing the stock: The stock has formed an ascending triangle showing a resistance point at around 6.40 a share, and has broken above it. Usually with these ascending triangles the stock can experience a gain in the height of the triangle or more. Look at the chart below (click chart to enlarge). Third Reason for purchasing the stock: As you can also see from the chart above the 4+% move up Friday was accompanied by large increase in volume. The 10 day volume for this stock is 402.7 thousand shares, Friday the stock traded very heavy volume of over 1 million shares. The price increase with volume increase is a very bullish sign. Fourth Reason for purchasing the stock: The stock crossed up above both the 10 and 50 day moving averages and held strongly above both into Friday's session. The chart of this can be seen below the 10 day average is the blue line, the 50 day is the darker green line (click chart to enlarge). Fifth Reason for purchasing the stock: As you can also see from the chart above, the stock crossed up above the 100 day moving average as of Friday and closed above it. 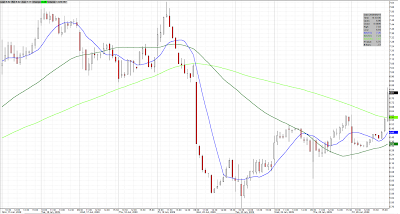 I have been speculating with this stock by purchasing the July 7.50 Call contracts. The theoretical price at which they can be purchased is $10 a piece. To learn more about opening a call position check out my option E-Book which covers the basics. The volume on these calls is not too heavy, so use caution if planning on opening a position. If you do not like this method you could always purchase the common shares and write the options out on the stock. These are just a few of the reasons I have been buying this stock, and plan to purchase more. I will be selling into strength.